Harry Britt is a former California politician and socialist. Jan. 9 1979: San Francisco Mayor Dianne Feinstein appointed well know Democratic Socialist Organizing Committee member Harry Britt to succeed slain supervisor Harvey Milk. In accepting the appointment, Britt said he considers himself the "third openly gay supervisor" from District 5 -- following Milk and Milk's aide Anne Kronenberg, a 25-year-old lesbian. Britt had wanted Feinstein to appoint Kronenberg, but Feinstein said she was concerned about Kronenberg's youth. 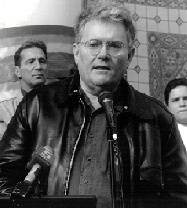 San Francisco board of supervisors member Harry Britt, addressed a "special unity convention session" on day two of the Democratic Socialist Organizing Committee/New American Movement Unity Convention in Detroit March 21/22 1982, that resulted in the formation of Democratic Socialists of America. Over 90 delegates and observers attended the Democratic Socialists of America National board in San Fransisco, November 9-11, 1990. DSA vice chair and San Francisco Supervisor Harry Britt, "enlivened the event". This page was last modified on 22 July 2018, at 03:41.